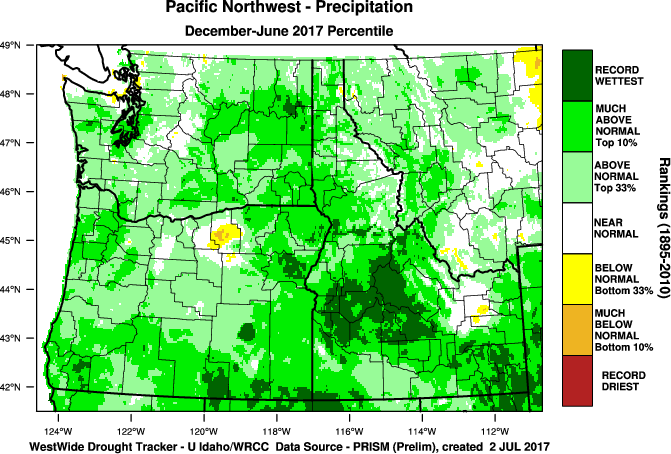 This past winter and spring had its share of flooding across southeast Oregon and southwest Idaho. Not only did spring runoff bring flooding to rivers and streams, but ice jams and snow melt caused flooding during the winter as well. The stage was being set for an active spring flood season as far back as October 2016, when 150 to 400 percent of normal precipitation occurred across much of the region which moistened the soil profile. 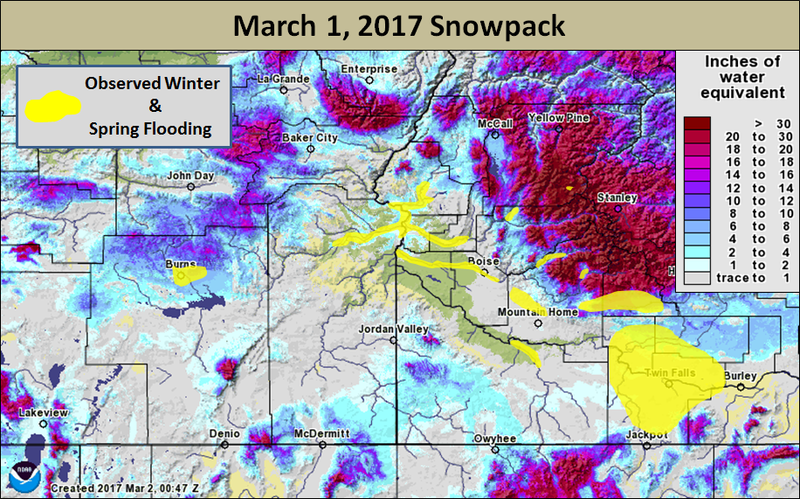 The winter storm track brought well above average snowfall to most of southeast Oregon and southwest Idaho, with extreme snowfall across lower valleys. A relatively cool and wet early spring was the final piece of the puzzle to ensure abundant spring runoff. An indicator of how wet this past winter and spring have been, water supply forecasts for the April through September period rank in the top 10 for most of southeast Oregon and southwest Idaho, dating back to 1970. Additionally, all major reservoir systems either have filled or are expected to fill. 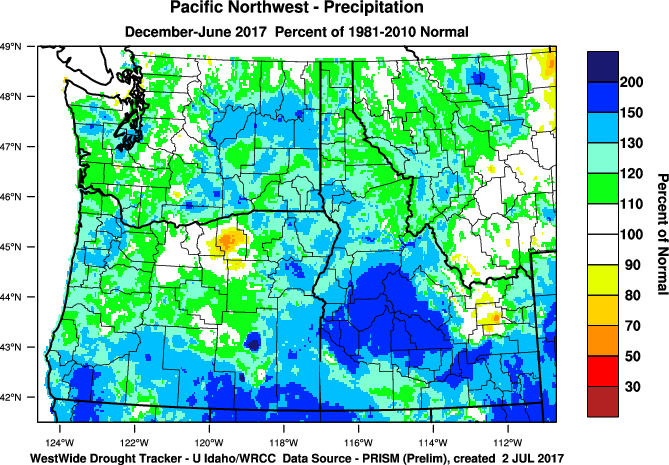 Record high precipitation was seen across many areas from December 2016 through June 2017, shown in the figures below. The map below shows March 1 snow pack along with areas where flooding had a significant impact. Although the threat of snow melt flooding has diminished, summertime thunderstorms can pose a serious flood risk. 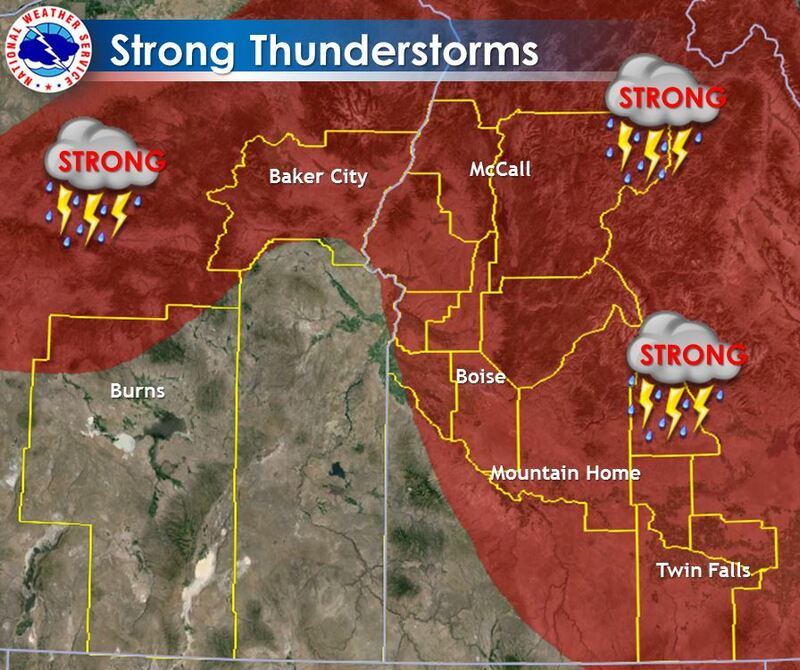 Areas of steep terrain and areas burned by wildfire are at particular risk for flash flooding due to thunderstorms. For flood safety information, visit http://www.floodsafety.noaa.gov/. For the latest river conditions, see http://water.weather.gov/ahps2/index.php?wfo=boi. We had a very interesting terrain-driven weather pattern last night. You may have wondered why Bogus Basin didn’t get any snow but Boise did? No snow at Bogus Basin, but snow on foothills and in Boise. An arctic cold front moved across the region from the Northeast as a low pressure moved across the area into southern California. When this happens air cannot easily get over the Rocky Mountains so it goes through the paths of least resistance, hence it moves in from the northwest via Hells Canyon and Baker Valley in NE Oregon and from SE Idaho via the Snake River Plain. Low Pressure moving into CA allowed cold air to set up convergence zone in Treasure Valley. Air in the lowest levels of the atmosphere collided, creating what we call a convergence zone. Terrain-induced northwest winds collided with southeast winds near Boise and Mountain Home, causing lift. This lift essentially squeezed the moisture out of the air…much like wringing water out of a wet cloth. 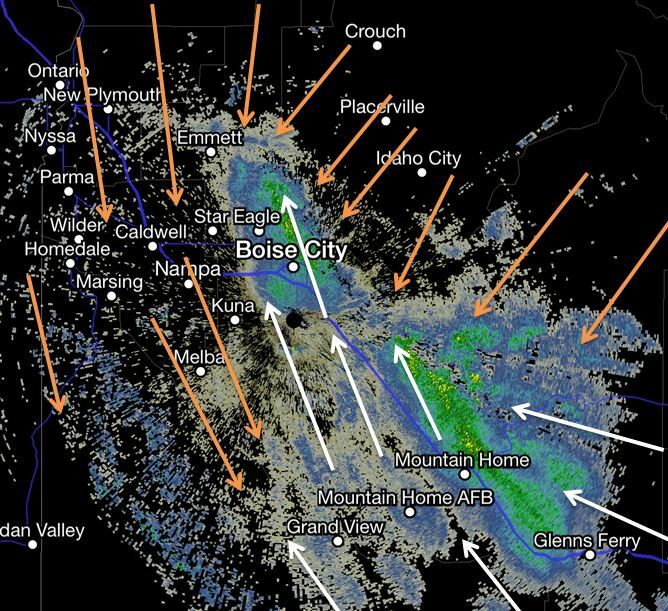 Radar Imagery: Southeast winds collided with northwest winds causing a convergence zone along the Boise foothills to Mountain Home east to the Camas Prairie. Areas in blue and green indicate snow. Bogus Basin was not subject to the convergence zone as the Boise foothills acted like a barrier, keeping the convergence zone in the Treasure Valley. 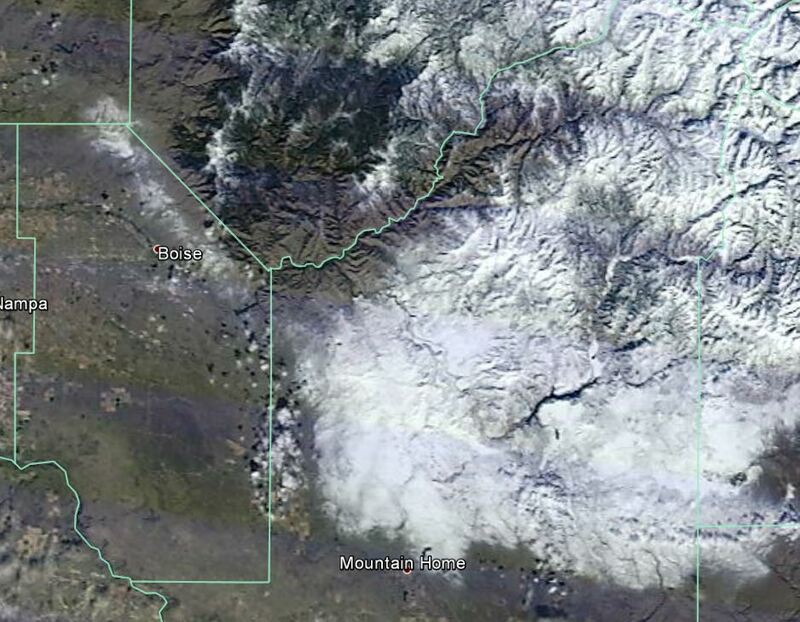 The areas where the snow-cover were visible on the MODIS imagery. Notice the swath of snow along the Boise foothills, east Boise, and areas east of Lucky Peak and north of Mountain Home. 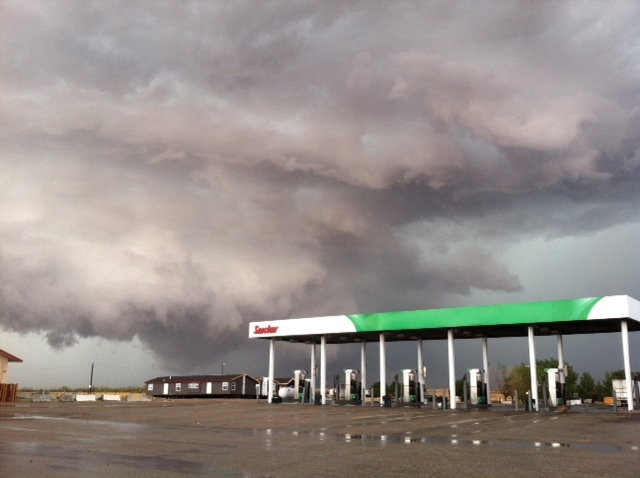 Conditions were favorable on August 13, 2014 for large hail, damaging winds and heavy rain across portions of southeast Oregon and most of southwest Idaho. Conditions were favorable for strong thunderstorms in the highlighted areas. 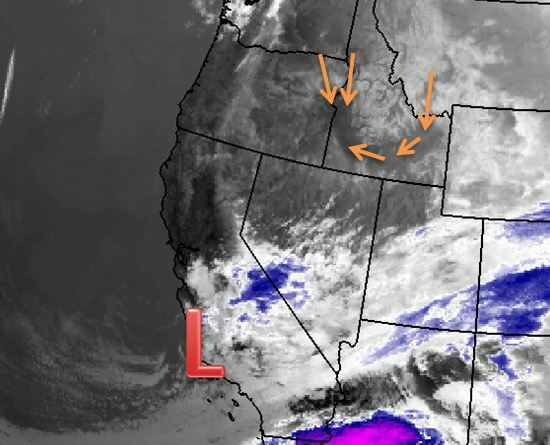 With an upper level low pressure system situated on the Oregon Coast, the upper level dynamics were favorable for strong upward vertical motion (thunderstorm development), especially over Idaho as the jet stream diverged from S. Idaho into N. Idaho, as seen in the following image. Jet stream divergence promotes upward vertical motion. We look at winds at different levels to examine wind shear, an important factor in strong thunderstorm development. Wind shear is important because it helps sustain and organize the thunderstorms, which can lead to large hail development. For more information on how thunderstorms, hail, tornadoes, and lightning form, click here. A special balloon launch was performed at Noon MDT (18 zulu). Normally, we do a balloon launch at 5am (12 zulu) and 5pm MDT (00 zulu) daily to get an profile of the atmospheric temperature, humidity and wind up to a height of about 100,000 feet. The atmosphere profile provided from our balloon launches are used in our Numerical Weather Prediction Models to help us and other National Weather Service forecast offices forecast the weather. 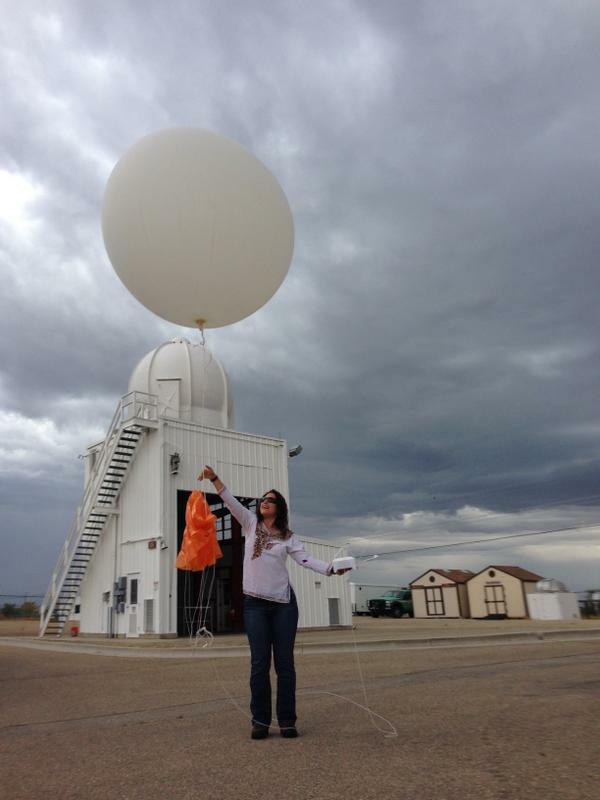 Special Balloon Launch at Noon to determine the atmosphere profile. The BOI sounding at 00z on 8/14 revealed high MU CAPE Values (1873), high SFC-6km shear (39kt), high precipitable water (PW) values of 1.12in. These values are favorable for supercell thunderstorms, storms which are favorable for large hail and damaging winds and heavy rain. The precipitable water values also highlighted a flash flood risk from abundant moisture in the atmosphere. 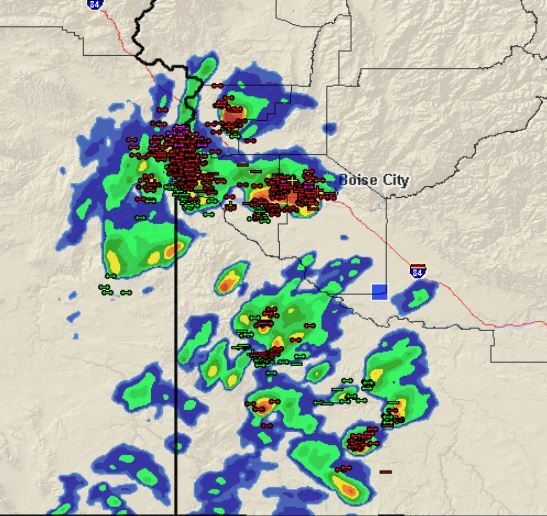 Storms began to form around 2pm MDT south of our area in Nevada and spread northeastward into the Magic Valley by 3:15pm MDT. These cells quickly blossomed into severe storms knocking down trees and causing flash floods on McMullen Creek, washing out roads. These storms produced wind gusts to 82mph at the Trail Gulch RAWS weather station, 8 miles north of Magic Mountain Ski Area. 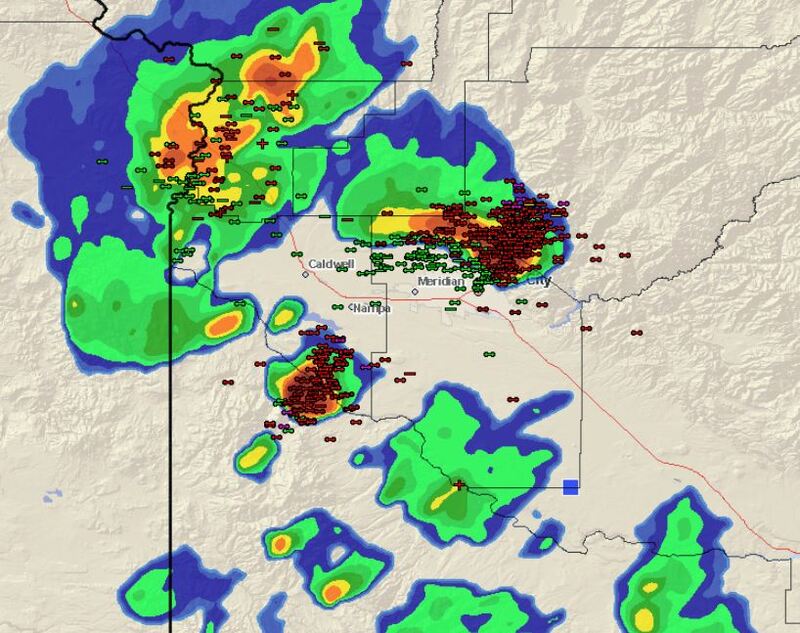 As the afternoon progressed, more thunderstorms started to form along the southwest highlands of Idaho and the Owyhee Mountains. 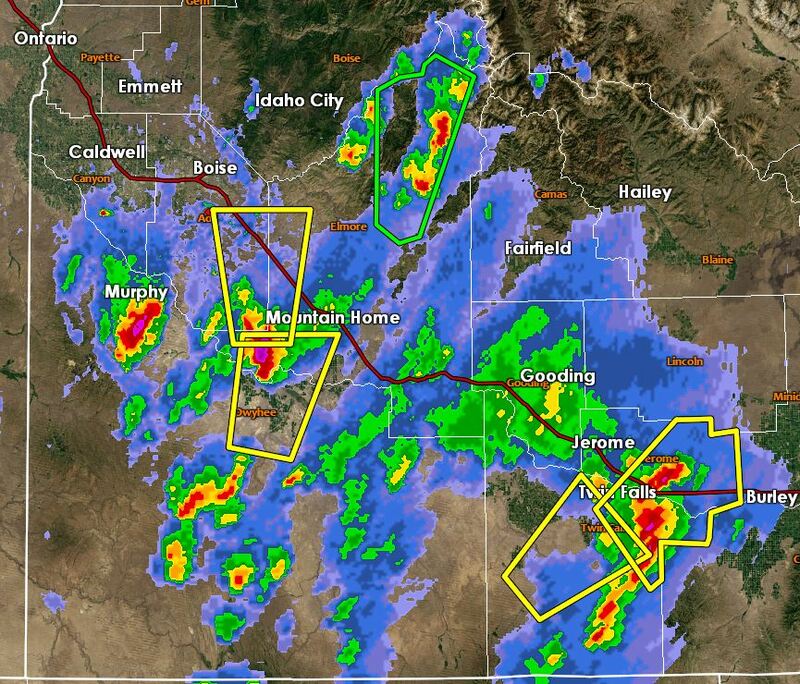 Severe thunderstorms southwest of Mountain Home began to form and move to the north towards SE Boise. 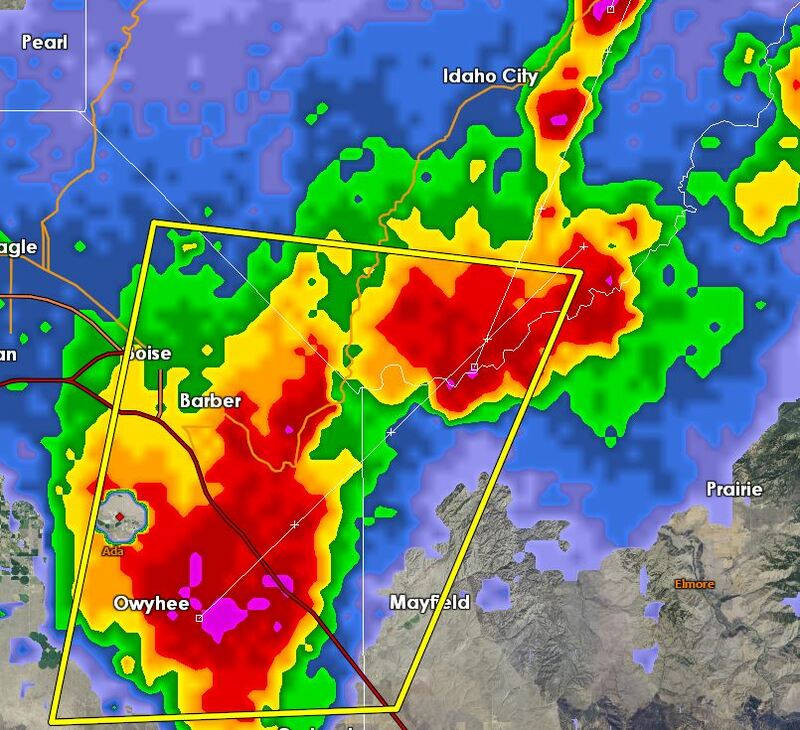 This storm produced wind gusts to 69mph just NW of Mountain Home as it trekked towards Boise. 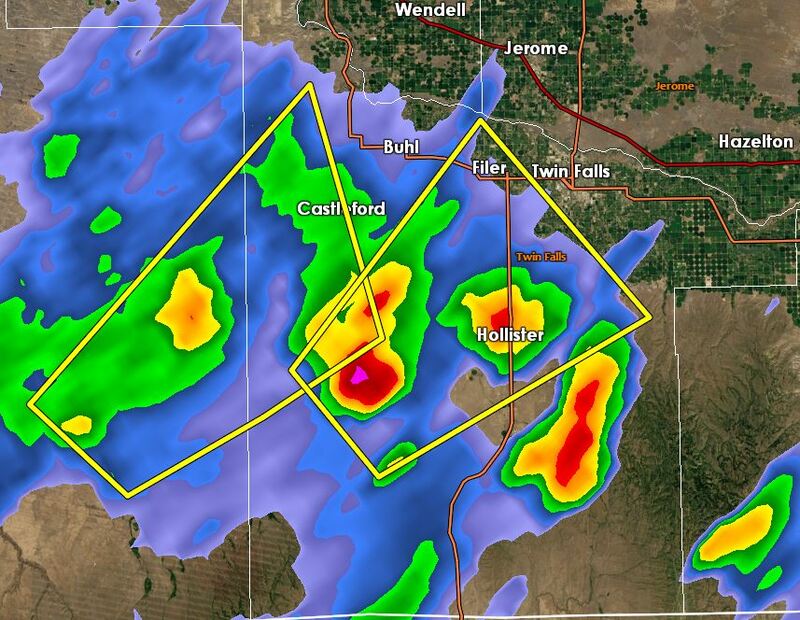 Another storm by Murphy was moving NE and it was on track to merge with the storm just SE of Boise around 4:30pm MDT. By 5:00pm MDT the storms merged between Boise and Mayfield. These storms moved into the mountains and produced debris flows across Highway 21, 2 miles southwest of Mores Creek Summit near the Hayfork Campground. 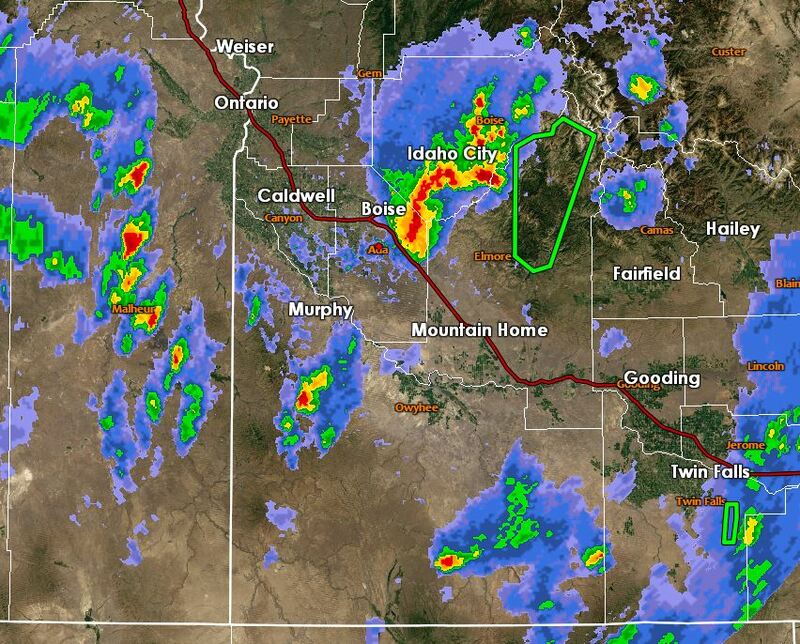 A spotter reported 0.87″ of heavy rainfall within 15 minutes with these storms just north of Boise. Just after midnight on August 14, the Treasure Valley was treated to heavy rain, small hail and quite the lightning show! Ada County reported 94 strikes on 8/13 which ranks as the 3rd highest count in August (since records began in 2000), and 15th highest all-time (since records began in 2000). These storms produced heavy rain, small hail and abundant lightning throughout the night. Some areas received up to 2″ of rain according to the radar with these storms. 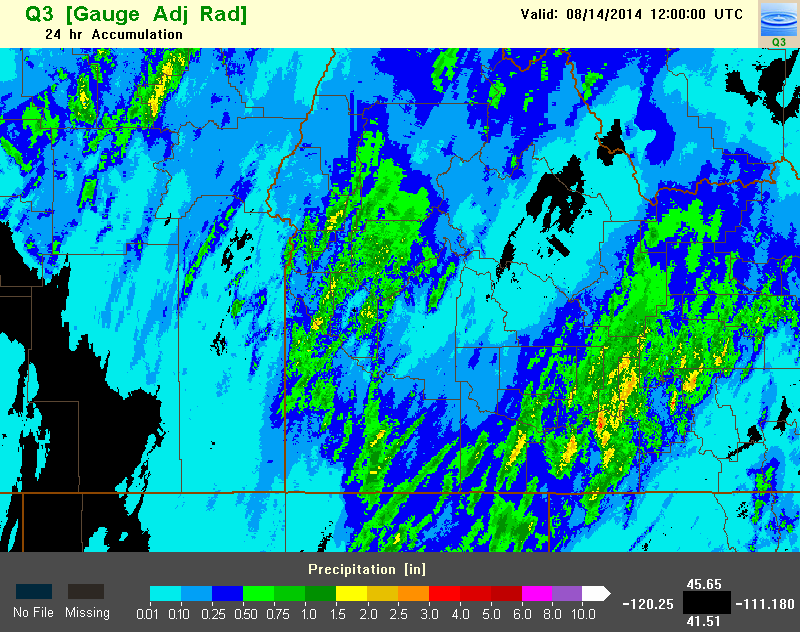 24 hour precipitation accumulation over southern Idaho and southeast Oregon. 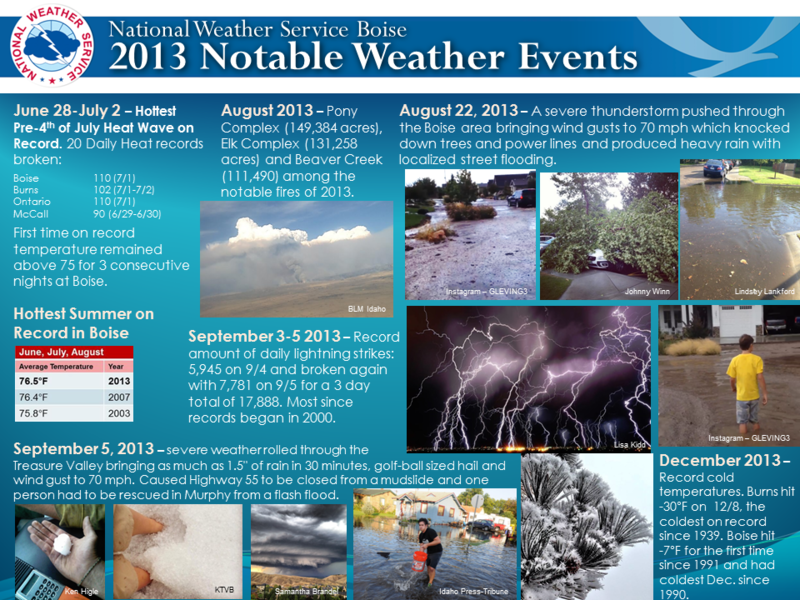 To recap, due to a unique atmospheric setup for our area, the storms of August 13th and 14th of 2014 produced wind gusts up to 82mph and 69mph in two separate storms, debris flows over Highway 21 in Idaho, flash flooding with some areas receiving up to 2″ of total rainfall and up to 0.86″ of rain fell in under 15 minutes, and a memorable lightning show for residents of the Treasure Valley.